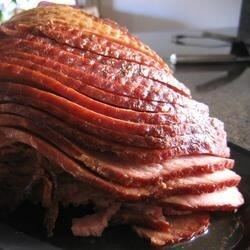 "This recipe has become, hands-down, my favorite ham! This has replaced our Christmas Ham and makes the entire house smell amazing! There is nothing like coming home with this ham cooking! Experiment with the amounts of seasonings to your liking. I prefer more nutmeg but some prefer less nutmeg and more maple syrup!" Press whole cloves into the ham so they are evenly distributed. You may score the ham for easier insertion if you wish. Place the ham in a slow cooker. Pour in apple cider until only about 2 inches of ham is above the surface. Pack the brown sugar on top of the ham, pressing into the cloves. This will get washed away in the next step but any that stays on is a bonus. HELP! I want to do this recipe but it doesn't say whether the ham is one of those "pre-cooked" ones that you just heat and serve or is it uncooked? I will never make a ham the traditional way again. We made one in the oven and one in the slow cooker.We definetly didn't have any left-overs from the slow cooker ham!! DEICIOUS!!!! I can't describe in words how awesome this is!!! With all the raving over it from my 15 and 17 year olds and hubby, this is going to replace MY Christmas ham, too!